_I'll be honest with you. 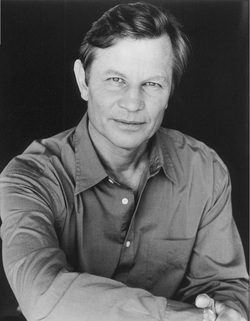 I'm a Michael York fan. For my money, I don't know if it gets any better than when he has a sword fight in the dark with Christopher Lee in "The Three Musketeers," and a "Logan's Run" poster hangs on my office wall. So I was happy to get the opportunity to interview him back in 2000. But before York ever stepped in front of the cameras he was a Shakespearean stage actor. Although he has not trod the L.A. boards in recent years, he is still very active in local arts, most significantly as Chairman of the California Youth Theatre, a “sister” program to Britain's National Youth Theatre, which gave him his start in the early-’60s. He recently teamed with longtime friend Adrian Brine to write The Shakespearean Actor Prepares (Smith and Kraus), in which they offer fellow thespians advice on how to approach and interpret the sometimes daunting texts of The Bard. Adrian and I have always written to each other. He’s a director/actor working in Continental Europe, mostly, and he’s always writing of his experiences, and very intensely. He always has wonderful insights, which gave me the idea that I’d like to be kind of his Boswell and collect them. So we thought about collaborating on a book about acting, and it seemed it would be a rather short book, because either you can do it or you acquire technique. But with Shakespeare it seemed you really did have to know something. Like climbing a mountain, you need the rope, the boots and the map. Today, most actors seem drawn to the profession by an intense desire to be media superstars, a la Madonna, but you actually had a love for the language and the stage. Do you think Hollywood suffers because of today’s actors’ general lack of stage training? Everything is centered on the words. Unless these words are clearly enunciated and understood, then you lose it. Everything is now so well-miked, you don’t have to learn to project, even at the Globe Theatre. We are losing something. We’re not as good as those Elizabethan actors, who could project, speak trippingly, naturally, and compel three thousand people to pay attention. But what works on stage doesn’t always work on film. Was it tough for you to make the transition? You have to learn to bring it down, to realize that the camera can do extraordinary things. The actor on stage has to pitch it to the back of the theater, even the intimate things that he’s saying, because an actor has to be heard. This is part of the equipment that you have to learn. Whereas the camera can dolly in and actually capture you thinking. I have a strong feeling that Shakespeare would’ve loved cinema, because he wrote cinematically. Everything jumps from one scene to another, from the outside to the inside. Soliloquies are sort of close-ups, someone thinking in action. He discovered something four hundred years ago that we’re just putting into practice. You were very fortunate early in your career to be in two very good big-screen adaptations of Shakespeare — “Taming of the Shrew” and “Romeo and Juliet” — both directed by Franco Zeffirelli. It was a wonderful way to begin one’s film career. Particularly “Romeo and Juliet” seems to have survived. The great paradox is that Juliet is 13. She’s a child. Yet she’s given the most vivid language to speak. Few kids of that age have the mental let alone vocal ability to get ‘round it. But on film you break it down into little moments, — as they did with Olivia Hussey, who was 16 — and you get something wonderful. Generations of kids have identified with this. Shakespeare’s not this old white male writing with a feather who’s a crashing classroom bore, but someone who actually seems to intuit their thoughts and their dreams and speaks their language. In Shakespeare plays there’s also a lot of crass stuff that’s put in for the crass audiences of the day. He wasn’t writing for academics, he was writing for a popular theater that had to make money. So the plays operate on several levels. Your Joe Blow public could pay a penny and go stand in the rain and see stories of fights, ghosts, murders, revenge... real mayhem. But your more intellectual Renaissance thinker could also see something to tickle his own fancy, addressing why are we here, what are we doing, what’s it all about? He gave the public not only what they wanted, but what they didn’t even expect that they wanted, and that’s why the plays have survived. Shakespeare was prolific and so are you. You’ve probably made more films than any contemporary of your stature. I do like to keep busy. If you are to believe William Goldman, “nobody knows anything.” It seemed to me that there was sort of an inverse law — the most assured, cast-iron production was usually the one that went belly-up and the most unlikely little orphan was the one that became the great success. You can’t predict these things, you can’t guarantee it, and that’s what makes it so fascinating. What was the greatest surprise success you’ve had? Something like “Austin Powers.” Who would’ve thunk it?